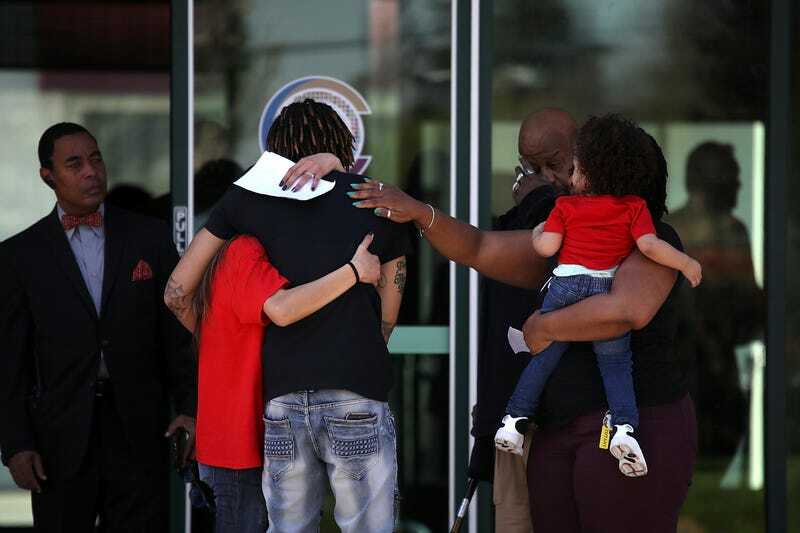 Mourners embrace as they leave a wake for Stephon Clark at the Boss Church on March 28, 2018, in Sacramento, Calif.
On March 18, two police officers in Sacramento, Calif., shot and killed 22-year-old Stephon Clark in the backyard of his grandparents’ home. It is not the first extrajudicial execution of a black man by police, and if there is no change soon, it likely won’t be the last. The nation is watching the aftermath of this shooting play out, and understandably, many of us have questions for both local and national government leaders as to what—if anything—will be done to prevent something like this from happening again. On Wednesday, White House press secretary Sarah Huckabee Sanders, aka Suckabee, was asked if the White House had any response to the public outcry for justice in the shootings of black men and women at the hands of police. Sanders said, “This is something that is a local matter, and that’s something that we feel should be left up to the local authorities at this point in time,” adding that the president is in full support of law enforcement officers. It is incredibly troubling—but not at all surprising—that the president doesn’t find this issue important enough to address. Black bodies have never been anything more than utility for labor and abuse in this country. The fact is, every single American, regardless of race, color or creed, should be concerned about the current state of affairs where all an officer has to say is “I was afraid for my life” in order to be exonerated in a killing. There needs to be a federal investigation into every police shooting like this, but that won’t happen because our government simply doesn’t care. Black people are not important enough for it to make a big deal about these deaths. For the White House to respond to the sadness and anger of millions of Americans as a “local matter” is the very height of immoral analysis. The White House’s statement is at best ignorant and at worst neglectfully dismissive. Families mourning the loss of loved ones in Sacramento, Baton Rouge, Ferguson, St. Paul, North Charleston, Staten Island, Baltimore, Tulsa and other communities would disagree with the White House’s assessment that this is a local matter. Studies have shown that black people are killed by police at rates disproportionate to our composition in the U.S. population. This is shameful and an international embarrassment. Enough is enough. We are tired. We want justice. I am not at all hopeful that we will get it, because neither the White House, the president, the attorney general nor our elected officials give a damn about back people.